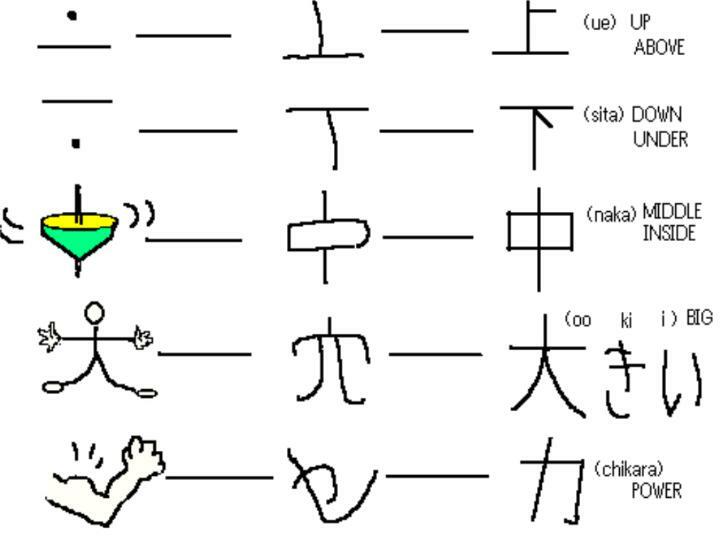 Kanjis Chinese characters are greatly classified into four groups by their origins. They are 象形文字[shokeimoji] (hieroglyphs), 指事文字[shijimoji]、会意文字[kaiimoji] (compound ideographs)、形声文字[keiseimoji] (phonetic letters). When people who are learning Japanese study them in the order, they can easily learn kanjis. I will explain each group in the following entries. Long ago the Chinese drew pictures as letters. For example, they drew a picture of a mountain and it meant a mountain. We call the letters 絵文字[emoji] (pictographs). The pictures were gradually simplified and abstracted. The Chinese drew letters like picture in simple lines. 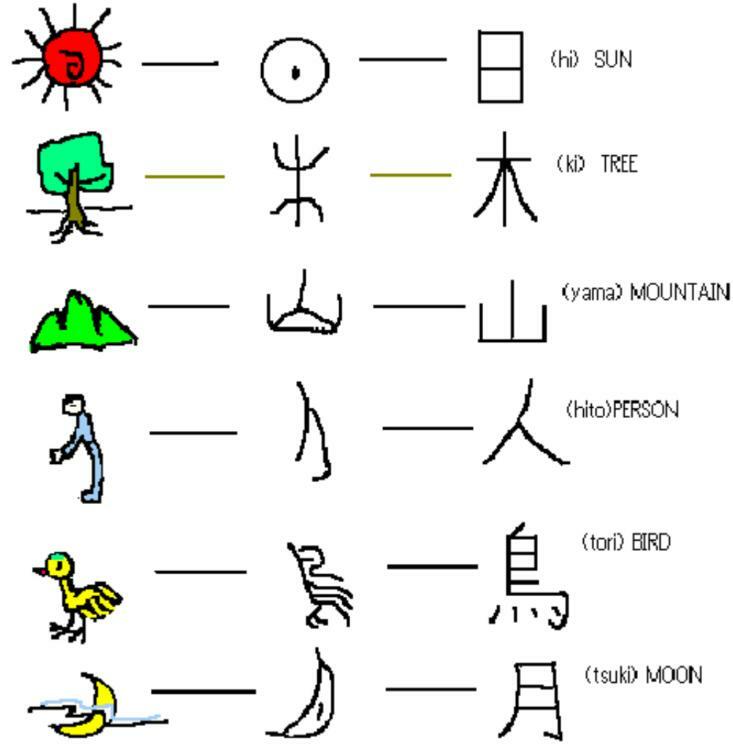 We call the letters 象形文字[shokeimoji] (hieroglyphs). "川" was made from the picture of a river. "山" was made from the picture of a mountain. It is easy for you to remember the letters if you understand what the original picture was. Long ago the Chinese thought of how to draw "top". They thought that it was difficult to draw like mountain and river. They drew a point above a horizontal bar which meant "top". Moreover, they drew a point below a horizontal bar whichi meant "low ". And, they changed the pictures to make it easier to write. We call them 指事文字（shijimoji) that show the abstraction of kanji characters . Please imagine the following situation. A man is sitting in the shade of a tree. Well, please guess what he is doing. Yes. He is taking a rest. The Chinese made "休（rest）" by combining 人（a man）with 木（a tree）. 林[hayashi: woods] is what has trees (木）side by side. 森[mori: forest] is what has many trees (木）. We call the letters which were made by combining kanjis 会意文字 [kaiimoji] (compound ideographs). Once upon a time the Chinese intended to express "copper" in a kanji. They had the word that meant "copper" . They pronounced it "ドウ[dou]" . And, they decided to borrow the letter of " 同" which meant " the same". The reason is because it was pronounced "ドウ[dou]" , too. However, it didn't mean "copper" but "the same" . So they attached "金" to "同" . In other words, 金 plus 同 equals 銅. "銅 (copper)" is related to metal, and it is pronounced "dou" . They matched the part that showed the sound and the part that showed the meaning. The Chinese made a lot of kanjis like that. We call the letters 形声文字[keiseimoji] (phonetic letters). A 蚊 is a 虫 which emits the sound "文". 蚊（a mosquito） is a kanji that puts 文[ブン] （sentence） on 虫 (insect) . We hear that the wings of a mosquito emits "BOOM[ブーン]" . 蚊（a mosquito） is a insect （虫） which emits the sound "BOOM 文[ブーン]" . Moreover, 鳩(a pigeon) is a bird which sings "KUU 九[ク]" . 鴉(a crow) is a bird which sings "GAA 牙[ガー]" . And, 猫(a cat) is a beast which cries "MYOO 苗[ミョー]" . do you understand the sound of the mosquito? "はい" and "Yes" , "いいえ" and "No"
"はい" and "yes" are almost the same meaning. In addition, "いいえ" and "no" are similar, too. "はい" means "It is what you say". "いいえ" means "It is not what you say". if he(she) answers "はい" . The "はい" means "As you say, I don't want it." if he(she) answers "いいえ" . The "いいえ" means "You are wrong, I want it." "は" and "the" , "が" and "a"
It is very difficult for Japanese to use the definite article "the" and the indefinite article "a" properly. I was corrected many times on the diary of this Lang-8. By the way, it seems to be very difficult to use "は" and "が" of Japanese particle for people who are studying Japanese. "は" sometimes corresponds to "the". "が" sometimes corresponds to "a". Thus, we use the particle "は" when we take something out, and we distinguish it from others. 「は」 is similar to "the" at that point. However, there are a lot of different points. the particle "が" and "は"
Let's examine the following sentence. "もし、彼女がジェーンなら、彼女はそれを知っている（If she is Jane, she knows it.） ". When you say "If she is Jane" , you are not sure who she is. Therefore, you use the particle "が" . When you say "she knows it." , you are sure that she is Jane. So, you use the particle "は". Next, let's examine this sentence in reverse. "もし、彼女がそれを知っていたら、彼女はジェーンだ (If she knows it, she is Jane) ". When you say "If she knows it" , you are not sure whether she knows it. When you say "she is Jane" , you know that she is the person who knows it. So, you use the particle "は" . I like 落語[rakugo] very much. Rakugo is a form of traditional entertainment in Japan..
One person called the 落語家[rakugoka : a comic story teller] tells a funny story. His story is funny and makes the audience laugh. He uses only limited tools such as a folding fan and a Japanese towel. He impersonates various people only with the expression of the voice and the face. I think Rakugo is an art such as music and painting. Rakugo has a punch line which we call 落ち[ochi]. I will write about it tomorrow. Rakugo has a punch line which we call "Ochi". "Ochi" is the last part of a story which is told with a joke or a pun. The rakugoka tells a funny story, and makes the audience laugh, and finishes it off with "Ochi". The novels written by him also has "Ochi". For instance, "The Romance of a Busy Broker"
"Don't you remember, Harvey? We were married last evening at 8 o 'clock in the Little Church Around the Corner"
Don't you remember, Harvey? We were married last evening at 8 o'clock in the Little Church Around the Corner." I thoroughly studied the content to teach well enough. And, I was fully prepared to teach enough. So, I was able to teach smoothly. However, I must not be satisfied here. Teaching well depends on whether the students understand what I taught, and they are able to solve the problem. I must not be complacent that I taught well. Japanese people basically like visitors to Japan. However, when you ask for directions, they will run away without answering. It is not because they dislike you. And they think that they must speak complete English. They are withdrawn for you at first. But as you get to know them, they will be very kind to you. We don't use the letter "ゑ" now, but I know it. However, I did not know "ゑ" is called "かぎのあるえ（え　with a hook)". I have looked it up. I write "ヱ" of the katakana letter as "ゑ" of the hiragana. Please see the first stroke of "ヱ". It is "フ", it is like a hook. So, old Japanese called this letter "ヱ" "エ with a hook". Because they were the same pronunciation, "ゑ" was called "え with a hook". It is interesting for me. Students feel like studying when they wrestle with a problem hard and can solve it. And they come to feel that it is interesting to study. They raise their academic ability, and come to challenge more difficult problems. Humans are originally animals with strong intellectual curiosity. If you stimulate it well enough, your students can continue to have fun learning. Japanese people bow when greeting. In other words we bend at the waist and lower our head. In the past, the Japanese sat on tatami mats. At that time, we knelt on the floor and placed our hands on a tatami mat to bow. Most of us sit on chairs now. Therefore we bow while standing. A younger person uses keigo (honorific expression words) to older people. I will write it in my next diary entry. When people speak to an older person or a person who is on a high-level, they use the honorifics in Japan. The honorific is a word that respects the person. For example, we usually say, "私は食べる(watashi wa taberu)" which means "I eat". However, we say, "先生は召し上がる(sensei wa meshiagaru) (The teacher eats)". People use "召し上がる" as an honorific expression, when they respect the person. Moreover, we say, "私はいただく(watashi wa itadaku) (I eat.) ". "いただく" is an expression that humbles the person. We show the respect by lowering ourselves and raising the other person. And, there is a polite expression "食べます" which means "eat", too. However, many Japanese are poor at using honorifics now. In Japan, we are expected to get along well with other people. People do not think that it is important that a person is superior to other people. It may be because Japan is an agricultural society, and the people are not able to live if they do not cooperate together. So, it is thought that it is bad to be different from other people. It is highly demanded that they act in the same manner as others. However, the idea of valuing individuality has increased in schools. When I read diaries of other people of Lang-8, I notice that there are a lot of people who like Japanese manga and anime. I loved manga when I was in junior high and high school. Osamu Tezuka ( 手塚治虫 ) was a huge influence on Japanese manga. I often watched his Astro Boy ( 鉄腕アトム ) on TV. In addition, I read his other works such as "Phoenix (火の鳥", "Black Jack", etc. He invented various techniques of mangas. Many manga artists such as Tetsuya Chiba, Fujio Akatsuka and Fujio Fujiko were affected by him and developed their original mangas. Few Japanese believe in Shintoism（神道）. A small percentage are Christians in Japan. Moreover, there are not a lot of buddhists either. In a word, a lot of Japanese do not believe in any religions. There is an idea that it is Japanese chivalry (武士道 bushido) that forms the spirit of the Japanese. Japanese Chivalry developed based on Confucianism. Samurais learned Confucianism well in Edo period. Confucianism is teaching of Confucius (孔子) in China. It is the philosophy that how the human lives. I think that the Japanese respect bowing and justice because of its influence. In Japan, there is a proverb "武士は食わねど高楊枝[bushi wa kuwanedo takayoji : Hungry Samurai sticks toothpick out of his mouth". It means that even if a samurai is hungry, he behaves as if he is full. I interpret that the samurai endures the lack of profit in the present as he chases his high ideals. The proverb expresses Japanese chivalry well. John Stuart Mill who was a philosopher said that it is better to be a dissatisfied Socrates than a satisfied pig. Each of "やる", "くれる","あげる" and "くださる" means "give". However, they have different nuance. "やる" and "くれる" are very similar. "やる" means "A person gives something to other person who is younger or at a low place or the animal, etc.". 「私が生徒たちに褒美（ほうび）をやった」I gave my students rewards"
「私が鳥にえさをやる」"I give bait to a bird"
"くれる" is used when a person gives something to me or to a person who is at my side. 「いつも姉が私に小遣いをくれる」"The elder sister always gives me the pocket money. " 「友達が妹に花をくれた」"The friend gave my sister the flower. " Moreover, "やる" and "くれる" are used when I give something to other person. "あげる" is used when I give something to a person whom I respect. "I gave a commemorative gift to the principal. " 「くださる」 is used when a person whom I respect gives something to someone". "The principal gave me the congratulatory telegram. " He came from a foreign country. And, he has lived in Japan for a long time. In addition, he is very familiar with Japanese culture and history. But the Japanese does not accept him as one of them a Japanese. His skin color is white, his hair color is not black, and his eye color is blue. He has a very different body from Japanese, too. Even if he talks in Japanese as well as the Japanese, the Japanese only think that he is a strange foreigner. This may not be fair. Mt. Fuji seems to be very popular among foreigners. The Japanese love Mt. Fuji, too. I like Thirty-six Views of Mt. Fuji of the ukiyoe print which Katsushika Hokusai had painted. He painted the figure of Mt. Fuji which he watched from various angles. Mt. Fuji can be seen small behind of big waves. We say a family name first and then a first name in Japanese. My family name is Nakamatsu, and my first name is Yoji. So my name is Nakamatsu Yoji in Japanese. Well, when I was in the first grade of junior high-school, my English teacher taught us we had to say our first name first and then our family name in English. And, I practiced "My name is Yoji Nakamatsu". On the other hand, there are people who say that we should say the family name first even when speaking English because the order of the name is Japanese culture. But when I say to western people Japanese order, I wonder if they can understand. Actually, I am at a loss which order of my name I should say. Japanese people study English in junior high schools for three years. Most Japanese go on to high school. So, we study English in high schools for three years. About half of Japanese enter colleges or universities. We also study English there for four years. Therefore, the Japanese are very familiar with English. I also read articles in psychology at a university by using a dictionary. Moreover, I was able to read Agatha Christie's novel. Though we are good at reading, we are not good at speaking and writing. I want to become good at writing English with this Lang-8. When you call someone's name in Japanese, you can apply "さん(san)" behind the name . "さん" can be applied to a family name and a first name. Moreover, it can be applied to both males and females. For example, "田中さん( Tanaka san )", and "一朗さん( Ichiro san). ", etc. If you apply "さん", he/she feels you respect him/her a little. When you call a boy or a person of lower rank, you can apply "君(kun)". For example, "田中君( Tanaka kun )", and "一朗君( Ichiro kun). ", etc. "様(sama)" is used when you respect more. It is often used for the direction of a letter. For example, "田中一朗様( Tanaka Ichiro sama )". "殿(dono)" is still used for a direction of a letter though it is a little old expression. "先生(sensei, teacher)" and "課長(kacho, chief)", etc. are applied according to the role and the occupation. Each of わたし, わたくし, ぼく, おれ, 朕 means "I". There are a lot of Japanese words which mean "I". "私（わたし）" is the most general word. It is used by both males and females. "わたくし" is a little more formal word than "わたし". You can use it when you talk with persons of higher rank. Both males and females use it. It is used when you talk with a person whose rank is equal to you or less than you. "俺（おれ）" and "わし" are more broken expressions than "ぼく". Females use "あたし" and "うち". They are more broken expressions than "わたし". Only the emperor can use "朕（ちん）)". "我が輩（わがはい）" and "拙者（せっしゃ）)" are old expressions. You can hear them on historical dramas of the television. What do you say "you" in Japanese? There are a lot of words which mean "you" in Japanese. Each of "あなた", "おまえ", "おたく", "おぬし", and "きでん" means "you". You can use "あなた" for an equal person and a person with a low place. It is used with a polite and friendly feeling. You can use "おまえ" when you look down on the listener a little. "おたく" is a word that puts a light respect for the listener who is not intimate. "おぬし" and "きでん" are old expressions. By the way, such words are not actually thus used. Instead of them the listener's name is used. You say "太郎君は何歳ですか(taro kun wa nansai desuka）" which means "How old are you, Taro?" The occupation and the official position might be used like "先生(sensei）teacher" and "課長(kacho）section chief", etc. For instance, "（鈴木）先生はきょうおひまですか｛(Suzuki) sensei wa kyo ohima desuka｝" which means "Are you free today, Mr. Suzuki?" We often omit "you" and "I". I wrote that there are a lot of words that mean "I" or "you" in Japanese. However, we often omit them. When we think that a listener can guess, we omit "I" and "you". This is natural in Japanese. 「おいしいところを見つけたんだ。（I have found a good restaurant. There is completely neither "You" nor "I" in the conversation. We often omit "you" and "I" like this. 簡素(kanso)", "殺風景(sappukei), "質素(shisso)" and "シンプル"
However, I received the following point. "殺風景" translates to tasteless or dreary, which in English sounds a bit negative. "殺風景" certainly has a negative image. "質素" means simple, frugal, modest, or undecorated. "質素" doesn't have a negative meaning. You can say "シンプルな部屋ですね" by using the katakana word "シンプル". Copyright © セルフ塾のブログ. all rights reserved.